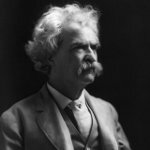 Mark Twain (pen name of Samuel Langhorne Clemens) created many novels and short stories, but is probably best known for The Adventures of Tom Sawyer and its sequel, Adventures of Huckleberry Finn. Tom and Huckleberry appear in two other novels, Tom Sawyer Abroad and Tom Sawyer, Detective. National Tom Sawyer Days are organized by Hannibal Jaycees. They are held from July 1 to July 5. The main event takes place on July 4, coinciding with Independence Day. The celebration typically includes a big parade, carnival, flea market, pet show, art & crafts show, talent show, fireworks display, etc. Most of the competitions held on this day are inspired from Mark Twain's novels. For example, the painting fence contest is based on The Adventures of Tom Sawyer, and the frog jump is inspired by The Celebrated Jumping Frog of Calaveras County. Each year, National Tom Sawyer Days attract tourists from all over the United States. Many of them visit the Mark Twain Boyhood Home and Mark Twain Cave.